The Logos Theatre has once again delivered a beautiful version of a Narnia story to the stage with the premiere of their version of The Horse and His Boy. 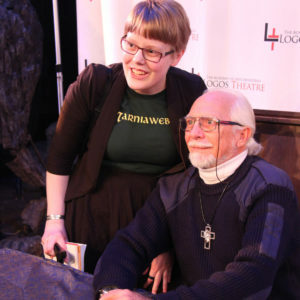 During a special session with a few fans during the intermission as well as after the show, Douglas Gresham (stepson of C.S. Lewis) stated that Nicole Stratton (who wrote, directed, and played Aravis’ stepmother) was one of two people he’s not afraid to get a script from. It is easy to see why. Although there were a few obvious technical hiccups and pacing issues, it was clear from the very beginning that this version of The Horse and His Boy was created by people who love the books just as much as other fans. The play opens with a prologue covering Shasta’s (Isaiah Johnson) backstory. Although some fans may find it controversial to start with a part of the story that is told later in the book, the decision works very well on stage. The tension begins almost immediately as the Centaur (Matthew Hainsworth) gives the prophecy of Shasta one day saving Archenland. King Lune (Joe Butler) and the queen (Haleigh Henegan) are visibly distraught, and that continues after Lord Barr (Justin Swain) kidnaps Shasta. The battle on the ship is one of the technical highlights of the show with the Archenlanders swinging onto the stage on ropes. It is also one of the emotional highlights as Butler gave a cry of despair and ripped his crown from his head when he realized his son was nowhere to be found. A recurring theme in the book is storytelling, and during an interview after the show Nicole Stratton said she wanted to use that in her version. As characters tell stories of what happened to them previously, the set pieces move around them and the audience is shown both the story as it is happening and the other characters the story is being told to. In some cases, this works very well. Aravis’ (Hope Barr) backstory was particularly poignant as she moved back and forth from interacting with Bree (voiced by Micah Hamilton), Hwin (voiced by Sheri Chavers), and Shasta, and interacting with other characters. This format was executed well during the emotionally fraught moments, such as Aravis’ attempted suicide. It was also used well for comedic effect when she describes her suitor, the Vizier Ahoshta (Eli Ramsour), to Bree and Shasta, and then the scene immediately cuts to Aravis’ father (Craig Stouffer) reacting to her saying the exact same thing at a party. This format unfortunately led to some of the technical fumbles. Because of the many moving pieces, the transitions were not always smooth and occasionally distracting. 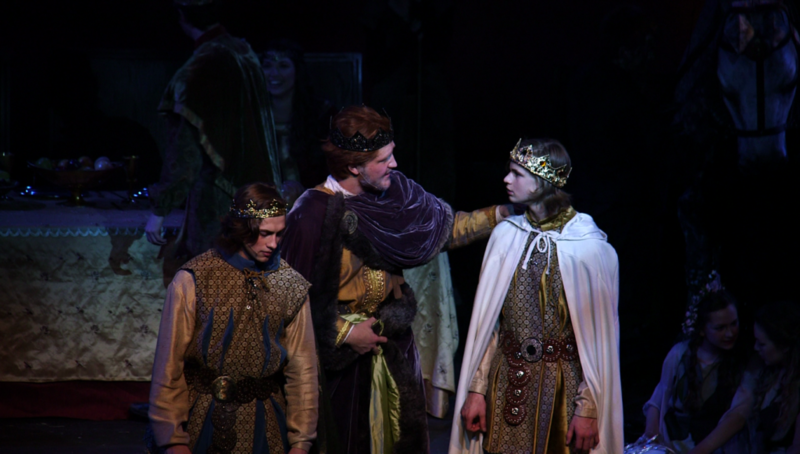 However, live theater often leads to technical mistakes early on and the longer the play runs the smoother these scenes should go. One of the best uses of the storytelling format was when Corin (Ethan Gueck) explained to Shasta where he had been. 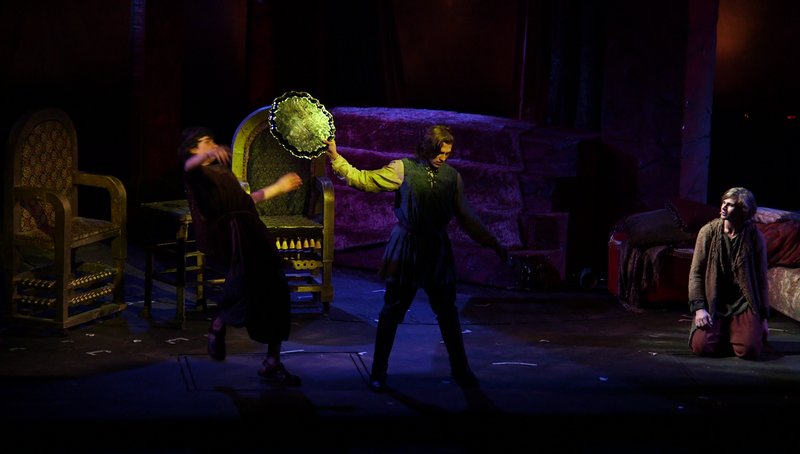 Corin knocked down and was knocked down by Calormenes all over the stage even though the set pieces never changed from the Narnians’ suite in Tashbaan. They even used props from around the room as part of the action. The audience laughed loudly throughout the entire sequence. Many of the other comedy-filled moments of course involved Lasaraleen (Leah Udinski). At times it felt like the character had simply walked off the page of the book onto the stage. Her introduction also involved one of the better uses of special effects in the show: when Aravis joins Lasaraleen on the litter. Every time Aravis closed the curtain, the light and sound of the crowd in Tashbaan stopped, and a spotlight shone inside the litter on the conversation taking place there. Then, every time Lasaraleen opened the curtain, the light and sound returned. That sort of moment requires a lot of coordination to get right, and everyone involved executed it perfectly. Another great performance was delivered by Rabadash (Jeremiah Johnson). He is awfully evil and was another character that felt like they had just walked off the page. After playing Peter for several years in the Logos productions of previous Narnia plays, Jeremiah Johnson embraced the role of the villain whole-heartedly. Although he did mention during an interview that he found it “kind of draining to be evil that long”. Even though the overall play should please any theatergoer and Narnia fan alike, there were a few scenes that may disappoint book fans. One example is the adaptation of the chapter in the book titled The Unwelcome Fellow Traveler. Much of the scene is well done, as fog obscured a great deal of the stage and Isaiah Johnson balanced very well Shasta’s self-pity and awe about Aslan’s (voiced by Nicky Chavers) influence in his life. However, Aslan and Shasta do not at any point meet face-to-face. In the book, Shasta sees Aslan at the very end of their conversation, but in the play Aslan remains hidden in the fog throughout the entire scene. Another scene that fell flat is the final one. 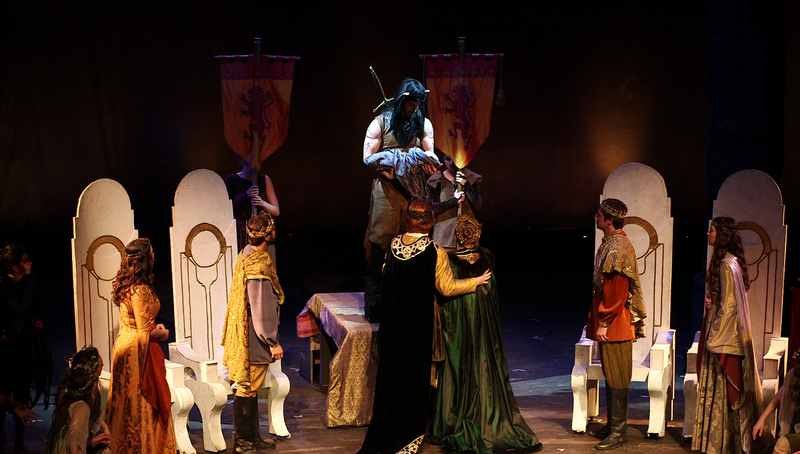 After the wedding of an older Shasta (Cooper Beer), now in his rightful place as Prince Cor, to an older Aravis (Haleigh Henegan), King Edmund (Noah Stratton) tells Queen Susan (Tome Cox) that King Peter (Stephen Bjorkman) has called them back to Narnia to hunt the White Stag. It is an unnecessary tie-in to The Lion, the Witch, and the Wardrobe that takes away the focus from the title characters. Not all of the changes from the book missed the mark though. In the book, when the main characters are sneaking into Tashbaan, Bree is the one to remind Aravis to pretend she has been beaten and called names all her life. In the play, Shasta is the one to deliver this line and it works splendidly. It is the first time Aravis realizes just what sort of life Shasta has led, and is the start of visible changes in how she treats him. Another change from the book that works well is a scene near the beginning where a cat comforts a young Shasta (Brinton Stratton). Narnia fans will know the significance of the cat puppet appearing, while other audience members will get a glimpse of Aslan’s influence on Shasta’s life early on in the play even if they may not know the importance of the cat just yet. One of the greatest parts of the play is undoubtedly the puppets. 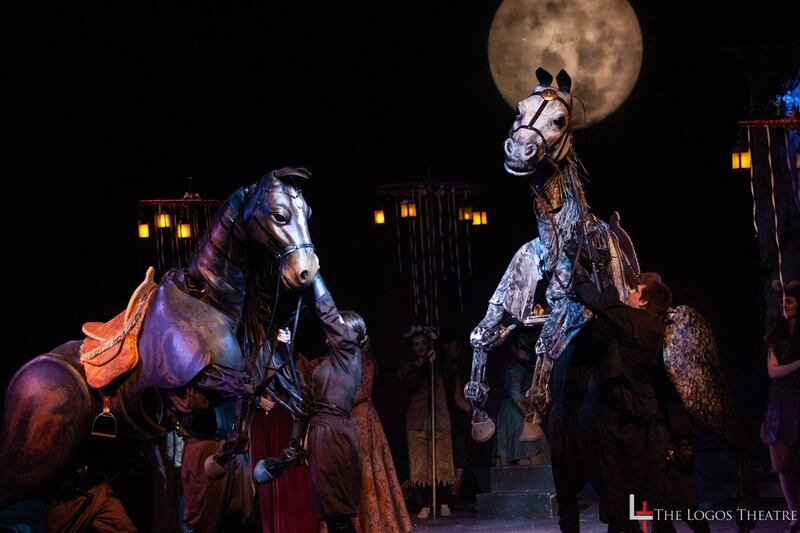 All of the puppets are extraordinary, but the horses are the true highlight of the show. They are just as good, if not even better, than any puppet on Broadway or the West End. The Destrier puppet used in Logos’ version of Prince Caspian was amazing, but the puppet team (lead by puppet designer Justin Swain, technical director Ken Hines, sculptor Harrell Whittington, and puppet apprentice Isaiah Johnson) outdid themselves in creating even better horse puppets to bring Bree and Hwin to life. All of the puppeteers deserve a great deal of praise, as not only are the horses incredibly heavy to operate, but they are also rideable, and not just for a few seconds. Aravis and Shasta spend several scenes on horseback with the horses moving very quickly both in place and around the stage. 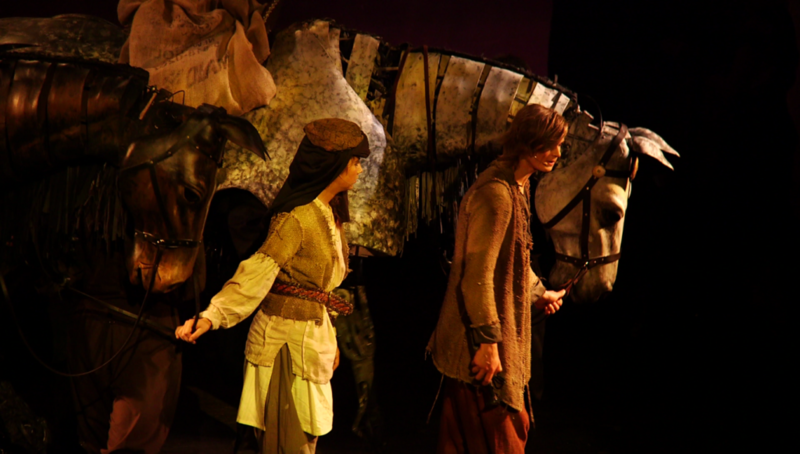 The puppeteers also spent time studying the way real horses move and learning how to move the puppets in similar gaits. 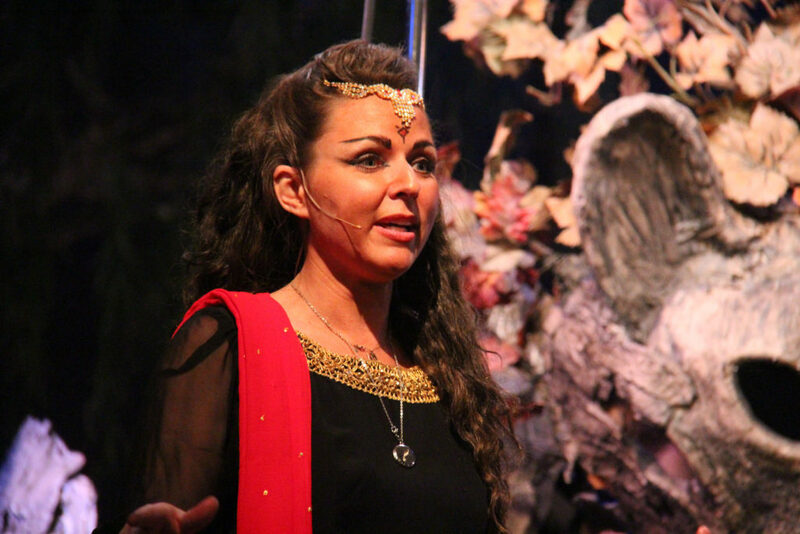 The stand-out of the puppet team is Hwin’s lead puppeteer Katrina McMindes. Her face and body moved with the puppet as though she herself was Hwin and not merely someone in charge of moving a prop. The Logos Theatre’s version of The Horse and His Boy is without a doubt worth the trip to Taylors, SC. Despite a few issues that might pull the audience out of the moment, the experience is not to be missed. Anyone who loves Narnia should love this play because it is produced by fans who love the books just as much. Before she became a NarniaWeb moderator in General Movie Discussion, Dot studied theater and film and regularly wrote critical reviews of stage performances for her college newspaper. 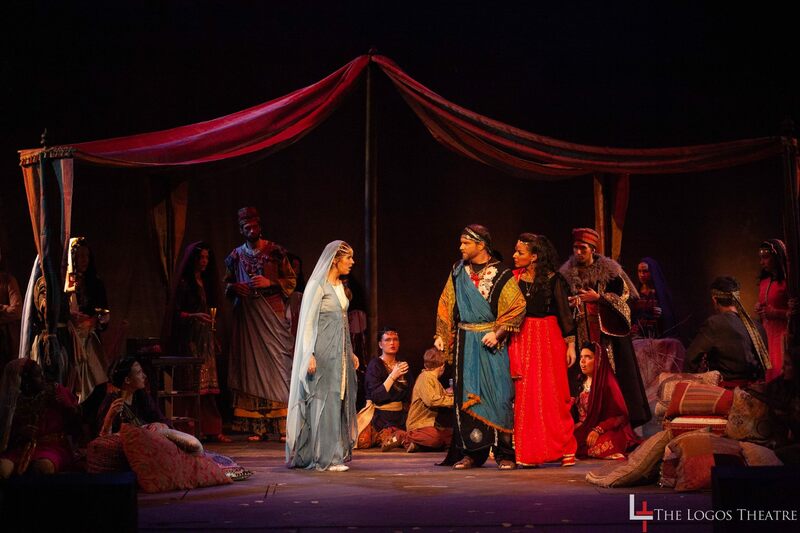 UPDATE: The Logos Theatre has uploaded 78 images from the play. View them here. I definitely feel very fortunate to live relatively close to Logos. There have been many stage performances of Narnia and other books by C.S. Lewis that I haven’t been able to see. Here’s a question to anyone who’s seen this Logos production. I’m assuming it has an intermission. At what point in the book did they end Act 1? And how did their Act 2 begin? 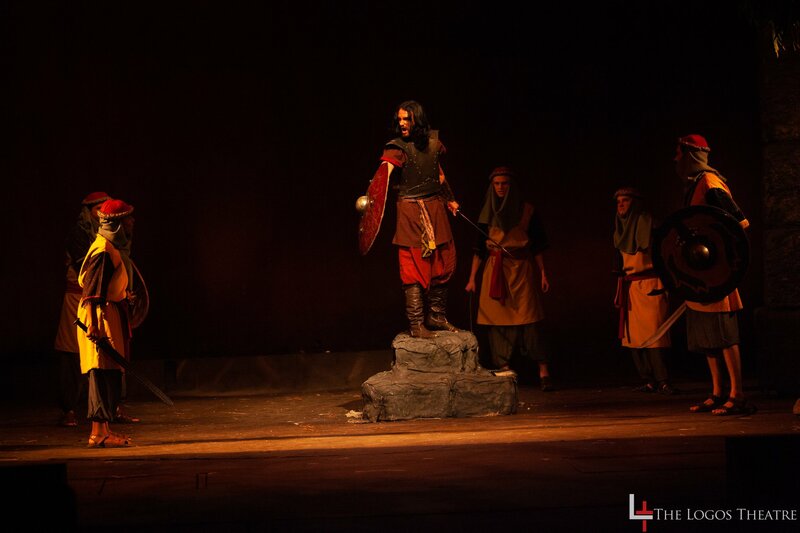 The intermission occurs after Aravis and Lasaraleen overhear Rabadash’s plan to attack Anvard. The next act begins with Shasta at the tombs. There’s a really cool moment where Aslan (in shadow) walks behind one of the tombs and then the cat walks out the other side. The scene overall was kinda disappointing but that was a cool moment. That’s a pretty good place to put an intermission; as a playwright myself however, I have my own opinion. I’d put the intermission just after Aravis & Shasta & Horses all reconnect, Shasta gets the news re Rabadash & learns he has a much more important reason to get to Narnia/Archenland; also, there’s now no time to lose! They’ve got to save Narnia NOW! – So I’d go into Big Galloping Music and our 4 reunited heroes racing across the Desert. Curtain … Act 2 would begin with a super desert trek music bridge sequence, & then pick up the story … Still, I do wish I could see this Logos version. it sounds very good! I agree with you, Fireberry. I was actually surprised that they put the intermission earlier. Like JFGII, I’m kind of depressed that I’ll never see it. Does anyone who’s seen it want to describe the scene where Aravis tells her father and stepmother she doesn’t want to marry Ahoshta? Aravis’ actress looks like she has great comedic timing. The way she closes the curtains to the litter shows you so much about how she’s feeling toward Lasaraleen. The best part of that scene was probably the beginning where her father overhears her opinions about Ahoshta’s age and appearance (that was actually one disappointment, the actor did not look 60, nor did he resemble an ape). The comedic timing of that moment was excellent. They involved the stepmother more directly in most of the flashback scenes. There is definitely a sense of her leading Aravis’ father around and him not seeing how she’s treating Aravis. She remains calm, cool, and collected while it takes Aravis awhile to pretend to be okay with the situation. So she doesn’t tell him her opinion of Ahoshta directly? He just overhears it? That’s interesting if I understand you. Who’s she talking to? The way they set the scene up, Aravis is explaining her situation to Shasta as the scene changes around them, and then the lines she delivers to Shasta is implied to have been overheard by her father. In the following conversation (Bree and Shasta are still present on stage but aren’t part of the scene itself), Aravis does speak directly to her father. A lot of scenes were set up that way. Scenery changes showing the flashbacks, with the storyteller interacting with both the listeners and whoever is in the flashback itself. If you’re referring to the one with the 360 theater, then no. Logos does seem to have been inspired by other versions in terms of a lot of their designs though. I don’t know at what point they decided on bark and leaves for Aslan’s design, but according to some people on the puppet team that I talked to previously they initially had a more realistic looking lion puppet. They decided not to use it because feedback indicated that the audience would look for all the ways it wasn’t like a lion, while a more abstract design helped the suspension of disbelief. Do they plan on releasing the show on DVD? Unfortunately, no. Distribution rights are an issue even though it’s stage rather than film. Well that’s a pain in the rump for people who can’t see it. I’m guessing the battle was done like it is in the book, with the Hermit narrating? How much of it did they show? Yes, the hermit narrated most of it. They didn’t show much, but the actors would run onto the stage fighting each other while the hermit was narrating that specific part. We do get to see Rabadash leap up in a spotlight but it goes dark before he lands. Probably meant to be the moment he gets caught on a hook, but something went wrong at the performance I saw and he wasn’t actually attached to the wall at the end of the battle. The pool the Hermit gazed into was one of the coolest sets. Really elaborate tree and hill. When I saw the show a second time, Rabadash dangled about a foot off the ground. Thanks for the wonderful review – I’m actually considering making the 13 hour drive to see this! It’d be cool if they could post the script online for people to read after the play runs. But I understand not wanting people to steal it and perform the play without paying royalties. The props are totally cool; a bit Walden-inspired in some places of course, like the four thrones and the Narnia banners. Rabadash looks a bit different from the way I’d imagined him. He doesn’t have any kind of crown or headgear (at least not in the pictures I saw). I agree with Glumpuddle, the Hermit’s pool is a really cool set! Many of the props aren’t just Walden inspired… they are actual Walden props that were used in the movies. Some are obvious and some are easter eggs for fans. Agreed Cleander, the prince differs from the book, but I guess giving Rabadash a turban and dark-face would’ve been too racist. A shame this won’t be on DVD. I was really wondering how they would accomplish Rabadash’s transformation. Can anyone tell me how that happened? Always seems like a tricky setpiece. Judging by the pictures, it looks like he has a donkey mask and gloves. Maybe they have other actors put them on him. That’s my theory. According to the program, Rabadash is played by Jeremiah Johnson while Rabadash (as Donkey) is played by Tom Allen. I think I know how they did the switch, but I don’t have confirmation. And they generally prefer I don’t share their tech secrets unless I have permission first. After watching Dot, Rillian and Glumpuddle’s video review, I want to attend one of Logos’ future Narnia plays! I live in Australia but I am saving up to go to Walt Disney World Florida anyway, so I am considering planning that visit at the same time of one of their Narnia plays in a year or two. Question: is the Logos theatre professional, or community theatre? Professional is when the actors get paid (and are usually union). Community theatre means volunteer actors who are unpaid. Both terms were used by the reviewers. I have participated in many (unpaid) community theatre productions and am curious. Sometimes there are shows where the leads get paid and no one else does, though I’m not really sure how those are classified.